Do you always lose on fruit machines? No! A small number of dedicated players make a regular income from them. We show you how. into triggering an unscheduled win! Fruit Machines, One Armed Bandits, Slot Machines. You see them in every pub and club. The flashing lights and sounds are a magnet to some people. And most of them lose. Because they play to a hunch. They feel lucky. The next pull of the machine will hit the jackpot. It seldom does. Relying on luck rather than judgement is a sure way to lose. 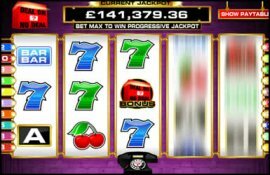 It is possible to earn a steady income from fruit machines. A small number of dedicated players regularly earn £100's a week by travelling around and carefully 'milking the machines'. Some players are so good at it they have to careful where they play. It is always better to spread the action around. We now show you how they do it. And how you too can legally empty Fruit Machines! We can supply Fruit Machine Secrets for only £7.95.